Sending this to blogger by Email. I hope it will post. I'm in Beijing right now, in an airport hotel, about to plunge off early tomorrow morning to Western China. Where, I am told, there may not be any internet or even phone text messaging, due to political unrest. So even emailling in blogs won't be possible. There's no Twitter here, no Blogger. I can see Neilgaiman.com but the Journal pages are blocked. So do not be surprised if I vanish. Will send photos or something as soon as I get back. I'll be travelling around China, but will definitely be giving a talk and doing a signing in Chengdu in about 11 days, and then I'll be in Singapore for the Book Festival with the lovely Amanda Palmer (who will also be playing a gig there). And apparently signing for everyone who comes to the Singapore Festival whether they have tickets or not. Before I got on the plane this morning (yesterday morning? 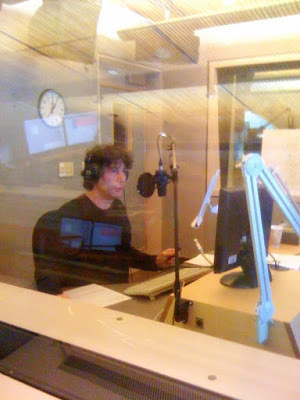 24 hours ago, anyway) I recorded my NPR MORNING EDITION piece on Audio Books. I interview David Sedaris and Martin Jarvis (who recorded the GOOD OMENS audiobook they're releasing on Nov 10th in the US) and Don Katz from Audible and Rick Harris, who produced/directed me in many of my early audiobooks. It'll be broadcast in November and I'm sure I'll be back in time to tell you when it'll be broadcast (with longer versions of the interviews on the web). Right. Bed, I think. Yes. Definitely bed.